… that was my strategy for the MdS, and it worked. I didnt die, or even get mildly lost, despite my ‘drip under the tree’ incident. However, I had a thought that the Spine Challenger would be a different story, particularly as there’s no mention of support from helicopters, or gimassive green lasers to guide the way, or indeed another 1000 runners on the course to follow. So that’s how we ended up at Mountain Run’s nerve centre in Watermillock, drinking brews and eating over-priced chocolate hob-nobs (they saw Glyn coming, again). We had a great couple of hours chatting about kitting choices, and nutrition and hydration, getting some good tips in the process, and also reinforcing some of the decision we’d made. Glyn’s face made me chuckle a number of times as he went from glee to ‘oh crap i’m going to die’. We then got our kit together, and piled into Chadderseses van for the trip to Dufton near Appleby in Cumbria, and the Pennine Way. Took us a bit longer to get there than expected, but I’ll not go into that, and we were out of the van and sorting ourselves out. It was like a Montane catalogue shoot with all the kit that we’ve got, and Charlie is another who’s getting support from them – not sure any of us will ever get a modelling contract though. Then we were off up the road chuntering away to each other. We rounded a corner and Charlie kicked in to gear – right where are we, how long do we expect to be on this path for, when will we be turning a corner. 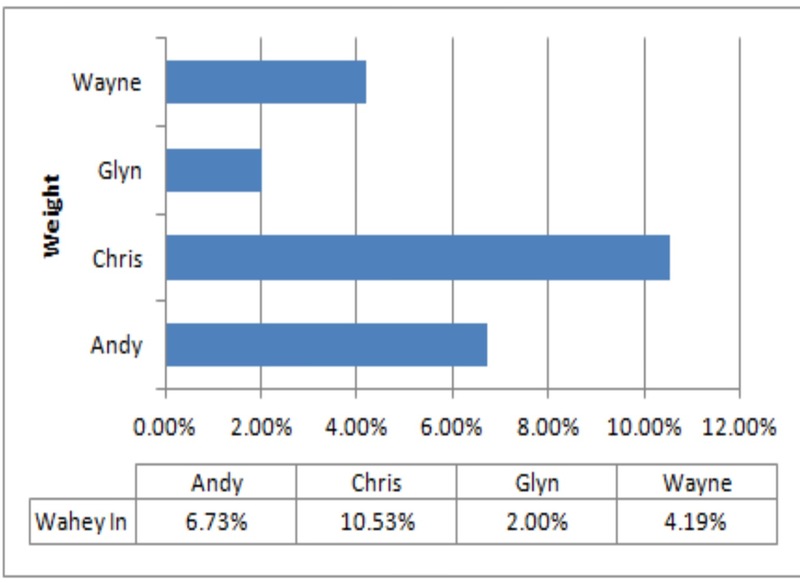 Glyn and Chads confidently answered the questions, I disagreed with them. Show me where you are Wayne…. Ah, that’s the problem, I’m going down the wrong path, starting in the wrong place. I was off to a bad start as I’d got lost within half a mile of the van! We got some experience in recognising our surroundings as we made our way slowly uphill, checking out where we were in the daylight to a pretty accurate degree. And then hit the snowline! And boy, was there a lot of it, which surprised me. This was pretty exciting, it was soon going to be dark, and finding landmarks was becoming more difficult in the snow, and then we looked around and saw the clouds moving in too. AWESOME!! We hit a cairn on Green Fell and the wind hit us. Flipping heck it was cold! We were fairly well kitted out between us, and had been gradually pulling on buffs, gloves and hats on as we ascended the fellside, but the wind went through me. The other guys started putting waterproof trousers on to get some wind protection to their legs, but I thought I’d be ok as I had Skins and walking trousers on – Lesson Number 1!! Charlie asked me to verify where we were by finding a sheep fold that should have been around 50 metres or so away. I put my head torch on and trotted over. Nope, no sheep pen. Some massive boulders, but they’re too big. Charlie used this as an excercise for us. Use the compass, measure the distance, pace it out. Nope, no sheep pen still. Phew, it’s not just me then (I’ll be back when the snow’s gone to find that bloody sheep pen). Darkness was now well and truly upon us, and we were into the bubbles of light on our headtorches and not much else. Talking through buffs muffling our voices. My finger tips were getting proper cold despite my gloves, so Charlie had us doing actions to get circulation going. Brilliant, they were warm again and Lesson 2. Now it was my toes, and snow was up inside my trousers and down into my goretex boots – wet cold feet – need gaiters – Lesson 3! These lessons were coming thick and fast now. Back to the cairn. Measure the distance to the next cairn. Take a bearing – bloody hell I got it right! Then it’s ‘two hundred metres, two hundred paces, off we go…. how’s everyone feeling’ says Charlie, ‘Bricking myself’said I. Good was the response, and off we went, off the edge of the earth (or so it felt). Two hundred and two paces later, and a cairn emerged from the darkness and I was bloody delighted. I couldnt get over the fact that I’d managed not to lose myself on the fell, although the other three had taken the same bearing and were walking alongside me counting too. At the cairn, we did the same again, with a longer count, but did the same again! Awesome! I was feeling comfortable and confident now as we took another bearing from cairn to cairn. On the downside, I could feel the cold leaching warmth from my legs and arms now, and I was getting really cold. I had a spare down jacket in my pack, which I was contemplating putting on, but then we made it to the final cairn and then agreed to get off the fell down a road and back home. We took a bearing to the road end, where it met the path, and off we trogged through the snow. As always, we had a great day on the fells, and it was good to introduce Charlie to some of our ‘banter’, which was at least 50% down due to the absence of Andy. All in all the day was fantastic, and I feel much happier about being in the darkness somewhere on the Pennine Way come Yorkshire. However, I’ll feel less confident in Chadwick, after the needle on his compass decided to reverse direction with North facing South, but that’s another story. The session was filled with questions – and half of which a was hands-on practical skills session on the hill that with practice will be close to transformational. Hugely enjoyable and I’m already thinking and doing some things differently: In ultras the small stuff really makes a big difference. Having now had the experience of a few ultras and heading into some longer event its about time I got my act together so far as eating on the hoof. With all the effort been put into health eating and weight loss, (which I appear to be doing rather well in !!!!) I need to make sure that I’m getting enough to eat on route but without killing all the hard work. With the upcoming Spine route recci it was the perfect time to see what worked. Im not a fan of really sweet sugary jelly sweets that give you a quick boost but for me just don’t sustain any prolonger energy, savoury foods work well for me but can be a burden to carry and keep in a good condition, so I decided on having a go at making my own Granola. A trip to the supermarket and an hour in the kitchen resulted in a tray of Low Fat Granola been removed from the oven. After cooling It was tested by the whole family with lots of Hmmmm’s all round even from the kids. Armed with four bags each containing two pieces it was an early morning start to meet the Ultramadness gang out at Hawes, another short drive allowing for car logistics and we were at Horton-in-Ribblesdale with a vehicle back in Hawes for our return journey. Granola handed out and off we set, a couple miles in and consciously trying to remember to eat a little but often it wasn’t long before we were trudging up hill and the perfect opportunity for tucking into my first piece, WOW sweet enough for that instant hit, chewy but easy to swallow even when breathing a little harder from the uphill effort, tasty and filling enough to feel like I’d eaten something of substance without that overly full feeling. The noises been made all round seemed to indicate I wasn’t the only one happy with the Granola !! Todays test was very positive for me, I wasn’t flagging or energy sapped by the end and most importantly my stomach agreed with the contents consumed . Next I need to have a think and see if there’s health savoury option to be made and tested!! After 20min remove from oven and cut into bite size or bar size pieces as you require, return to oven for a further 15 min. If you like your Granola slightly soft and chewy remove it from the oven after 15min and allow to cool naturally, if you like it harder / crunchy switch the oven off after 15min and allow the granola to cool inside the oven. Tune in for next weeks weigh -in to see the effects of Low Fat Granola !!!!!!! A weekend of mixed fortunes…..
Well last weekend was one of mixed fortunes which started Saturday morning at Parkrun Harrogate, only my 4th in total. Id set my PB back in September last year and was struggling to beat it. Normally we have pacers to latch onto and push for a a better time but this weekend none were available. So of i set off and pushed on hoping to make good time. Conditions were good, cold and clear with a light breeze so i shouldn’t have been too surprised when i knocked almost a minute off my PB setting the bar at 25:38. Well i was very surprised and also VERY pleased, Sunday however was to be a different matter. So id agreed to meet Deborah at Osmotherley to take part in the Osmotherley Trail Series entering the half marathon event. It came in around 15 miles and id dropped down from the Marathon event as Chris wasn’t available. Good job he wasn’t able to attend as my car wouldn’t start at 7am on Sunday morning and despite many attempts to get it going it was to no avail. So an apologetic call to Deborah only to find out that although already at Osmotherley Deborah needed to about turn and return her fellas car keys from the passenger door pocket as he needed to drive to Glasgow! All in all a bit of a shambles. So instead i managed a lovely but cold 6 mile trot round Harrogate exploring a couple of trails id not ran before, so all was not lost! What with this Wayne & Glyn having to abort their run, Sundays non event for me and Chris on Football duty we’re really going to have to step up our training regime! Lets see what this weekend brings! Wayne – how far have we done? 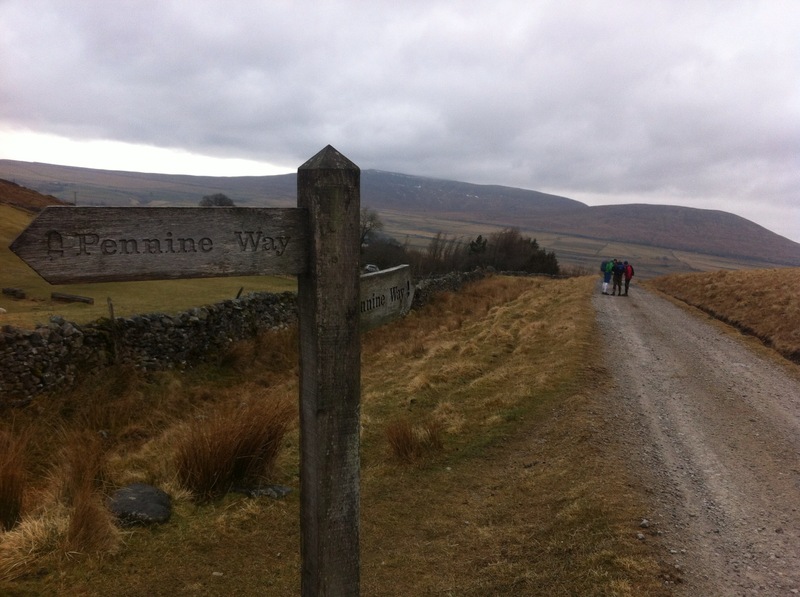 Glyn – three and a half miles mate, why, what you thinking? Wayne – I’m thinking I can’t manage another mile of this before we get to Gatescarth Pass. Can we go back? This was the conversation that we had stood looking down into Mosedale last Saturday. 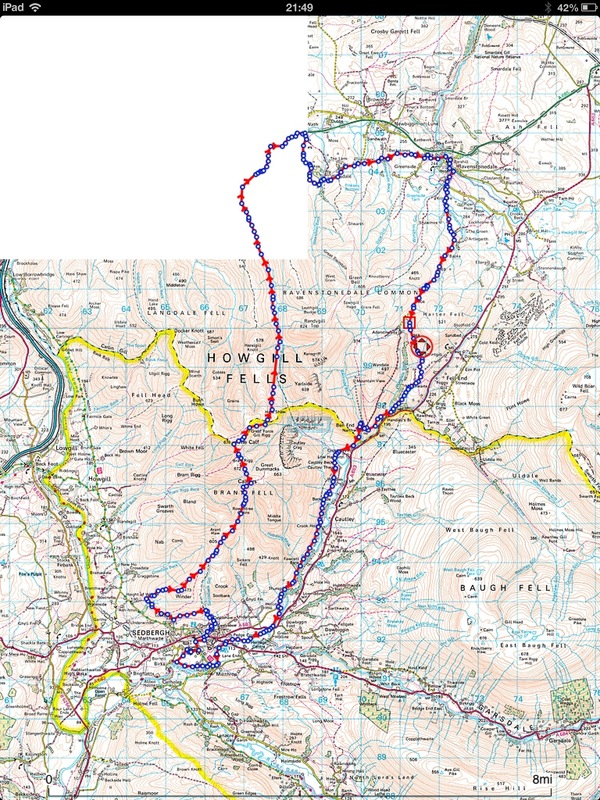 We’d started off from Wet Sleddale near Shap, with the intention of running to the car we’d dumped on Friday night near Dubbs Reservoir, above Troutbeck which would be around 16 miles. It’s name gives away what the ground is like in Wet Sleddale, and it never fails to disappoint. It’s pretty high up and there was still plenty of snow around, particularly as we climbed up onto the tops. The wind was howling down and we were pretty wrapped up in Buff, hat, gloves and jackets on top, but that wasn’t to be where the trouble lay. 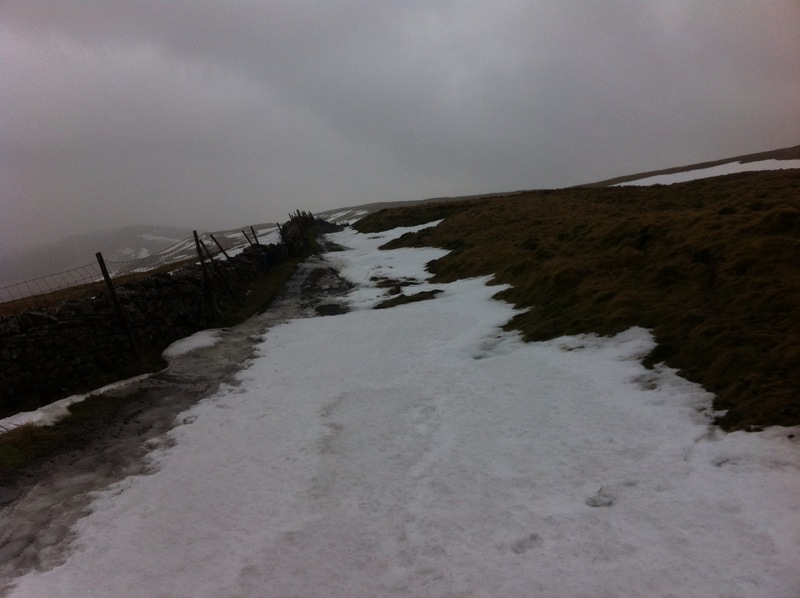 As we got higher, the amount of snow increased which proved difficult underfoot. At times for about three footfalls, we were flying along on fairly solid snow, then it gave way and we were shin deep. It was to be one of these instances that led to us turning round. I was shifting along when suddenly my foot went through the snow, cracked a layer of ice and plunged mid-shin in water that was so cold it made be gasp. I was frustrated that I’d done it as well as being instantly freezing. My foot was numb and I tried to move along a bit quicker to warm up. The problem was that there were two alternatives – carry on running on snow with the same problem of going through it, or move on marshy ground with freezing water coming into my shoes with every footstep. I think I managed to grit my teeth for about half a mile of this before the conversation above with Glyn. Training didn’t go quiet as planned this weekend. 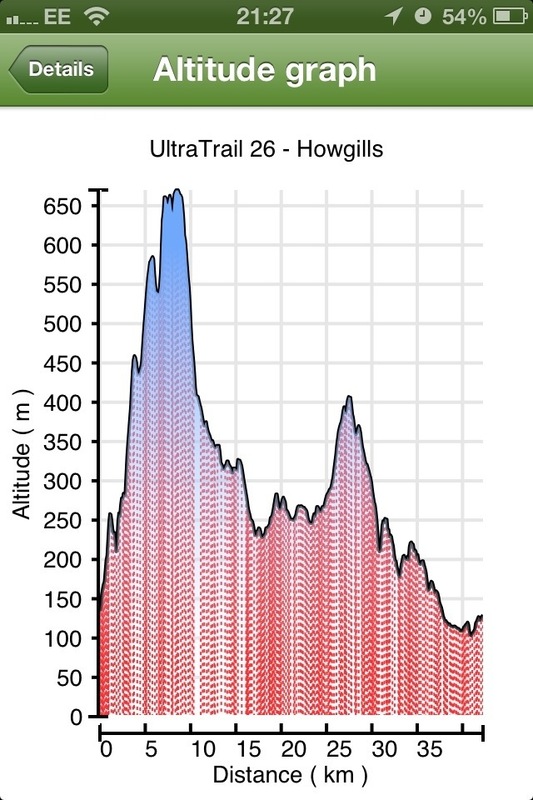 Wayne and I planned to run a 16 miler from Wet Sleddale reservoir to the bottom of the Garburn trail, near Troutbeck. After running 7/ 8 miles it soon became obvious that we would be running the best part of those miles with frozen feet. There was still some snow lurking around from earlier in the week, when it put down several inches, and this covered most of the trail. So running on it became interesting, as we didn’t know how solid it was and what was underneath it. We soon found out, Ice cold water and lots of it. So do we continue with frozen feet – mmm not a good move. So, after some deliberation it was agreed that we would turn around and trot back to the car. Solutions: Buy inov8 gortex boots, or thin mid calve sealskin socks with Injinji performance liner sock underneath it. Worth ago and a much cheaper option than inov8 boots. So after some marvelous work from Andy the ultra madness blog is up an running and ready for my first blog !! I should at this stage point out I’m completely new to this blogging lark so here goes. How much should I try to do, how often should I be out, am I doing enough or too much? Non of this really matters as right now I’m legged out on the sofa feeling completely shot after 10 straight completely manic days at work, yes I’m self employed and will be the first to admit that there’s loads of advantages in been so but it also means I don’t work your average 9 to 5 with weekends off. I’m often away from home and doing ridiculously long hour, leaving me no time for running or cross training…. 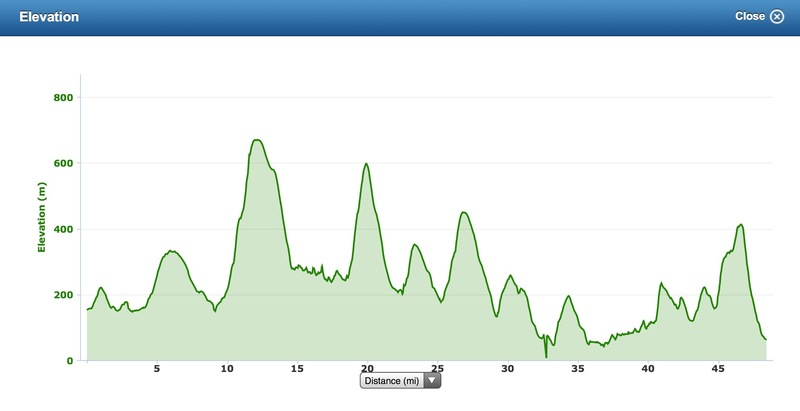 So how on earth am I going to cope with running 108 miles across the Pennines in January next year ??? 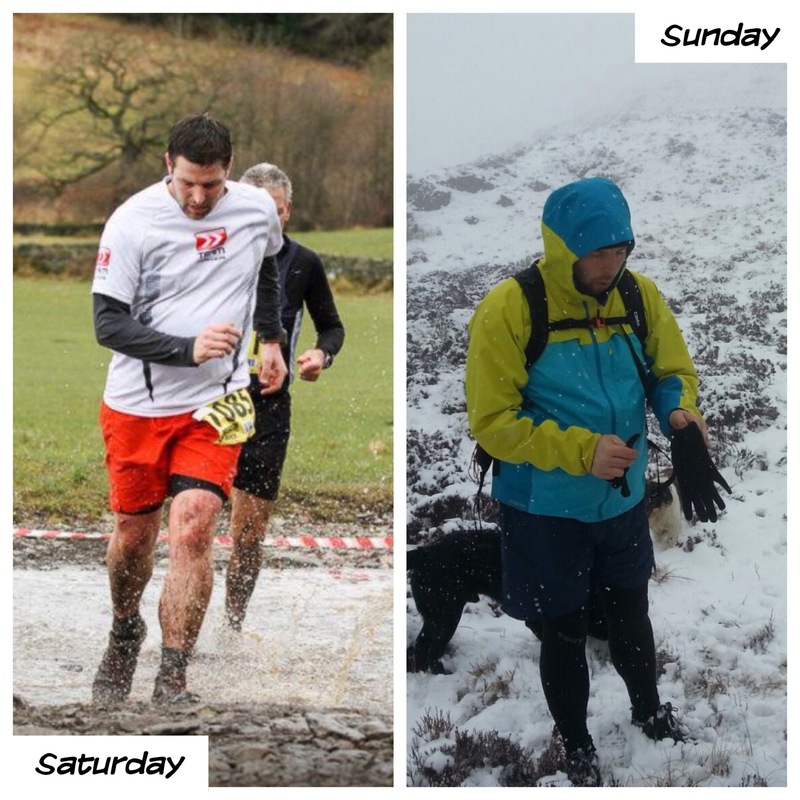 It’s not going to be easy but ill be getting out and doing as much as home and work life allows which should give me a good grounding to start from, personally i believe Ultra running is 30% physical and 60% mental…. Weather you think that’s mentally strong or mentally stupid I don’t think it matters, if you can control your head and convince yourself that you can continue when your body is screaming to stop your able to complete any challenge. That’s only 90% I hear you say well that final 10% comes from your surroundings and fellow competitors, when all else fail stop and have s look around at where you are, who you’re with and take a min to think of those not able to be in your position. Right time for a nap… No no I mean a run !! Ok people this is my first attempt at writing a “blog”. All i can say is I hope WordPress has an edit button somewhere. Having a partner and and two small children, one 5 and the newest addition only being 9wks old, i’ve had to switch my training slightly to running in the mornings. Not 100% but if i’m going to get the mileage in it has to happen. So with this in mind, i set my alarm for some ridiculas time and went for it. Over the past week i’ve managed to get up early for the past 4 morning, clocking up around 13 miles. Which for me is amazing, not the distance but getting up. You see I was born on a king size bed, wrapped in a 13.5 tog duvets some 44 yrs ago, so trying to get out of one at 6 am is a bit of a struggle. That said i’ve been up and out, pounding the streets in all weather and strangely i have really enjoyed it. Ok i have to have a power bar at 10 am to keep me awake for the rest of the day, but hey a small price to pay. Yesterdays plan was to ditch the car and run 18/19 mile back to the front door. A cracking route which i’ve done plenty of times before. At the last minute, Simon, a friend of mine who’s 10 years younger and 3 stone lighter and runs like a greyhound decided to come along. His plan was to run 6 miles out then return for my car and drive it home for me. A good plan that worked a treat. We left home not long after 7 am and with in 5 miles we were driving in snow with the dashboard shouting its -2 you fool. My first thought was “good move to put on your HH Charger base layer”, quickly followed by “-2 that’s warm compared to a potential -10 it could be when completing the Spine Challenge, followed by “Simons going to be cold in those shorts”. Everything went as planned and after running through 4″ of snow for 6 miles Simon departed and i plodded on, through farmyards, down tracks across fields and every now and again past a house, totally in awe of the screnary, mother nature and the stillness of everything at that time. There is something really satisfying knowing you’ve run 10 plus before most people have even woken. Anyway things were going great, but I start to feel peckish, so i munched on a power bar that’s i’ve not tried before, which at the time tasted great but minutes later I new something was up. I went from 10 minute miles to what seemed like 7 minute miles in a matters of seconds, with the aim of try and get home as quick as possible, but to no avail. For the first time ever I had to “phone a friend” to come get me. I guess that’s what training runs are all about. Trying out new things, finding what does or doesn’t work. On arriving home i was questioning if It was a weakness to make the call – I don’t think so, whilst most people were still sleeping i got 13 miles in and i know what power bars not to buy and what “special” piece of kit i need to put in my rucksack for that just in case moment. Not a bad mornings run and learning curve after all – Result. Ill “blog” some more soon. So the challenge is that between 29th Jan and 25th June every Tuesday morning we’ll be weighing in (gives an extra last chance to shift those weekend excesses) and recording the % loss against our individual starting weights. He he loses less shall be deemed the ‘loser’, the one with the greatest % loss will be crowned the ‘ultra’madness biggest loser and scoop the prize fund which no doubt will go on kit when in fact it should probably go to our suffering families!!! Parkrun #3 at Harrogate tomorrow! It might only be 5k but its great for speed work, weight loss and general fitness!! !